The Downtown Business Improvement District on Thursday joined several other business organizations in Missoula by placing its support behind the proposed redevelopment of the Mercantile. Over the past several years, the organization said, the building has been assessed to house the Missoula Public Library, the Montana Museum of Art and Culture and Missoula College, along with other uses, including a school, a call center and a grocery store. Linda McCarthy, executive director of the Missoula Downtown Association, which includes the BID, said the city’s core took a hit when Macy’s left the Mercantile in 2010. The building has sat vacant ever since, and BID members are eager to see the block revitalized. The BID joined the Missoula Downtown Association and the Missoula Chamber of Commerce in supporting a $30 million proposal to construct a Marriott hotel on the property. The project, proposed by HomeBase, is awaiting approval of a city permit to deconstruct the Mercantile. The permit, however, is stalled in the Missoula Historic Preservation Commission. After a four-hour public hearing earlier this month, the commission delayed a decision after its members said they needed more time to work through the findings of fact related to the permit. The commission had scheduled a work session to review those facts this week, but only four members showed up to do so. Still, those present said they had enough information to make a motion on the permit at next week’s meeting. While the commission weighs the facts surrounding the permit, the city’s economic groups are eager to see the process move forward. The economic activity generated by the hotel and additional dining and retail opportunities would have far-reaching benefits to the district, the BID believes. 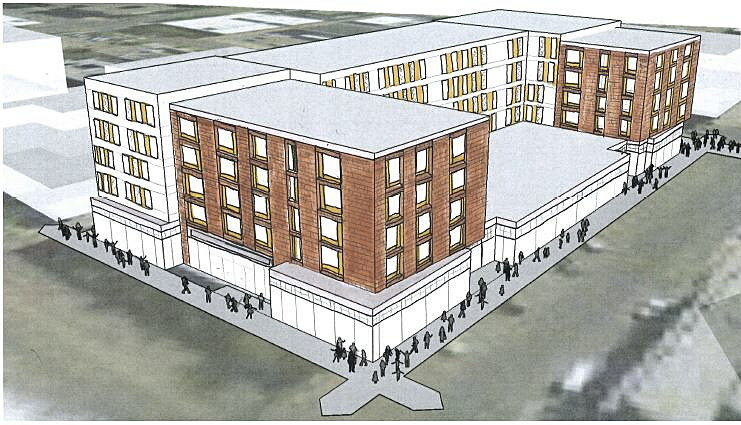 HomeBase is proposing a 154-room custom hotel with 24,000 square feet of retail space on the ground floor. Developers say the project would create an estimated $6 million in new annual wages and generate $13 million in annual revenue. The BID said the project gels with the city’s Greater Downtown Master Plan, which calls for new lodging amenities within the district. While the Mercantile generates $22,000 in taxes, the new hotel would generate $800,000 a year, according to developers.